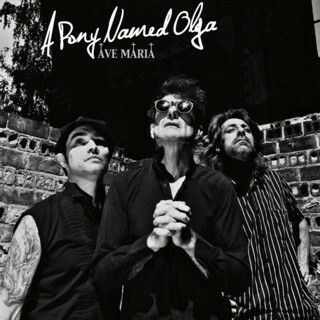 Ave Maria is the latest release from Berlin-based trio A Pony Named Olga. Though known in the States primarily from their appearances at several iterations of both SXSW and the Muddy Roots Festival they are a favorite on the live circuit in Western Europe, having played hundreds of dates at clubs and festivals over the past ten years. The band is often lumped onto the “psychobilly” heap but possess a level of musical and lyrical sophistication that discredits this categorization. The band’s music is an intense mashup of polka, surf, punk, jazz and rockabilly that is often combined with Latin rhythmic styles. Ave Maria is a fun and wild ride with thoughtful tunes that will appeal to fans of hard-edged roots music.